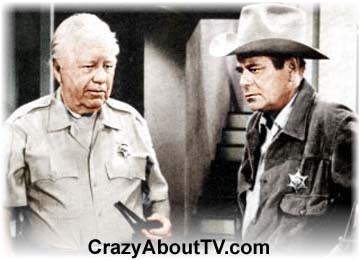 The Cade's County TV show was a 60 minute crime action series on CBS about the strong but caring sheriff of a county located in the southwestern United States. Sheriff Sam Cade's are of jurisdiction was Madrid County in California. He was based out of a town that was also named Madrid. The Cade's County TV show was kind of a modern day western that emphasized the challenges of a sheriff who had to deal, mostly alone, with a large area's crime. There were numerous gunfights. The still ongoing problems of the American Indian trying to survive in a white man's world were also often highlighted. Glenn Ford had already had a long, highly successful career in movies before the premiere of Cade's County. He was voted the number one box office star in 1958! Most of his movie roles had been as the tough, silent guy with a fast draw of the gun in westerns so his role on Cade's County was a perfect fit! Glen was perhaps the fastest draw among western stars in real life. He was able to draw a pistol from its holster and fire in four-tenths of a second. That was faster than both John Wayne and James Arness ("Gunsmoke"). Six years after Cade's County ended, Glenn was inducted into the National Cowboy & Western Heritage Museum's "Hall of Fame of Great Western Performers"! Glenn Ford also had many accomplishments that had nothing to do with his acting career. He achieved the rank of "Rear Admiral" in the U.S. Navy Reserves. He also enjoyed hang gliding which he decided to take up at the ripe old age of sixty-four-years-old! Edgar Buchanan was also already a big star. He had appeared in more than 100 movies including thirteen with Glenn Ford! Before becoming an actor at age 38, Edgar worked as a dentist! His wife, who Edgar had met in Dentistry school took over his practice so that he could enter show business! He often helped his fellow actors with their teeth problems. Once he actually pulled a tooth from his "stand-in", Jack Henderson", right on the set of a movie! Edgar also starred on four other TV series, "Hopalong Cassidy", "Judge Roy Bean", "Petticoat Junction", and "Green Acres"! One of Sherrif Cade's deputies was named Pete (last name never given) and he was played by Glenn Ford's real-life son, Peter Ford! Cade's County was a great TV show with a great cast. It probably would have done fine in another time slot. Unfortunately, it came on the air in the middle of NBC's hit western series, "Bonanza"! That undoubtedly killed any chance it had at high ratings! Thank you for visiting our Cade's County TV show page!